The office of the future, as viewed through rose-tinted augmented reality glasses. A new film from augmented reality outfit Meta paints a vivid picture of how the office of the future may no longer be dominated by banks of monitors. 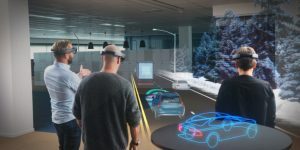 The video, which features the firm’s second-generation augmented reality headset running its new Workspace productivity software, depicts workers wearing high-tech-specs interacting with virtual PC desktops, or in meetings collaborating on 3D models. Silicon Valley-based Meta is one of the protagonists looking to bring general purpose augmented reality headsets to market. Founded in 2012, Meta made a splash on the Kickstarter platform in 2013 and has since been backed to the tune of $75 million. Yet while its hardware – and indeed that of its competitors – advances to a point of maturity, the search continues to find practical, genuine, revenue-generating use cases upon which to hang these thousand-dollar headsets. In Meta’s vision of the office of the future, augmented reality headsets perch atop employees’ heads, projecting infinite adjustable touch screens within the wearer’s personal workplace. The traditional desktop mouse and keyboard remain, but much of the activity takes place in mid-air with gestures to grab, swipe and pull virtual windows and objects. There’s smartphone interactivity here too, with notes and images from the real-world handheld’s screen only a pickup and push away from the virtual workspace. So confident is Meta’s vision that its charismatic co-founder, Meron Gribetz, has made another grand gesture on his staff’s behalf: in Meta’s offices, flat screens are now consigned to the store cupboard, replaced by Meta’s own head-mounted displays. A home-grown showcase – and a beta test – for the future of the workplace. Shoulder surfing at Meta HQ just got a whole lot more difficult. It’s easy to be seduced by the ‘wow’, but forget about grasping the why. While it’s easy to be short-sighted about future technology, there’s little yet to suggest how wearing immersive reality glasses to read an email, browse the web or scroll through a spreadsheet will be any less painful than it already is on a flat-screened display. Indeed, once the novelty of the arm-waving gestures wears off, many tasked with frequent manipulation of a Photoshop image, for example, may simply rest their arms back on the desktop and revert to a trusted keyboard shortcut, mouse click or pen-tablet — all of which appear faster, more ergonomic, and more accurate. Some might call that lazy, others productive. Once collaborative working is layered on top of virtual and augmented reality technology, however, more solid use cases begin to appear. Rapidly iterating a prototype design alongside geographically dispersed teams provides a genuine benefit – a workflow already widely employed in some industries. Outside of the office too, when navigating or performing unfamiliar tasks that may benefit from instant, heads-up contextual guidance, augmented reality technology has a tangible benefit. Meta isn’t alone in the race here. The leading pack also features Microsoft HoloLens and the enigmatic-but-elusive Magic Leap – almost $1.5 billion of investment to date can’t be wrong, right? – both of which have also played out their visions of the future workplace. Apple and Google are chasing too, but have chosen a different tack, engineering platforms to help developers explore from the comfort of their own smartphones and tablets. Apple’s ARKit received solid air-time at the firm’s WWDC developer’s conference this year, and will likely feature again in September’s iPhone reveal. Google announced its own augmented reality developer’s kit this week, ARCore. Even Facebook is in on the act, announcing its AR extensions during its 2017 F8 conference. The fact remains that augmented reality in anything other than niche applications is still an uphill sell. Firms have long presented how immersive technologies will revolutionise the way we work – but we’ve still to see a standout application that looks likely to endure beyond short-term novelty.